The DVD Backscatter by Robin Fox, released in 2004, contains ten audiovisual compositions. These works were produced using a hybrid mix of digital sound synthesis and analogue sound-image transformation. Initially, a digitally generated audio signal was transmitted via two output channels of a sound card. 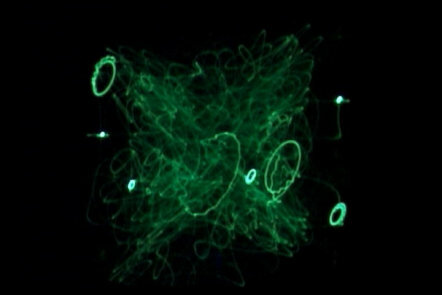 These signals were made audible using amplifiers and simultaneously rendered visible by means of two oscilloscope inputs. Following the same principle as Lissajous curves, they deflect the cathode ray of the oscilloscope, in the form of perpendicular superimpositions. Due to the possibilities of digital technology with regard to complex waveform syntheses and algorithmic programmability, Fox was able to produce considerably more complex audiovisual artifacts than those resulting from the video and oscillation experiments of the 1960s and 1970s. In this sense, the Backscatter series resembles a collection of études, within which the different possibilities and limitations of this specific media alliance can be explored. Each composition represents a variation on the artistic exploration of the electronic signal. The forms of vibration structured by abrupt changes in waveforms and repeated multi-layering clearly reflect their algorithmic derivation. At times, owing to the complex curves of the signal envelopes, the figures appear to be layered, duplicated, spatially offset, or to merge to form streaky surfaces. Fox even turns the sound card itself into a sound source by synthesizing software frequencies above the Nyquist limit, that is, at over half the sampling rate (in this case 24 kHz). Thus contravening the Shannon sampling theorem, the sound card converters generate fold-over frequencies that are mirrored as characteristic artifacts at the Nyquist frequency. When the audio output frequency reaches a sufficiently high value, the mirrored frequencies become audible and, in the work Nyquist Variations (2007), which operates exclusively in this frequency domain, they become visible as subtle distortions on the oscilloscope screen. In his sound-laser performances Fox integrates the concept of an electronic interconnection between sounds and images using the oscilloscope, yet he also extends the projection into a spatially geometric environment. The audience is submerged audiovisually in mist-filled rooms, and experiences not only sound as a corporeal echoing resonance of the eardrum, but also photographic images as projections reflected on bodies.